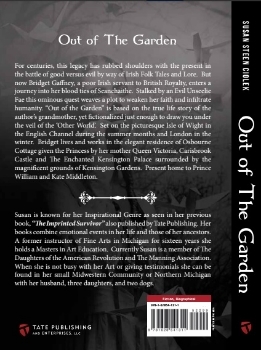 Out of the Garden will be released in 2014, based on my grandmother’s life as a household servant to Queen Victoria’s youngest child, Princess Beatrice, in the early 1900s set in London at Kensington Palace and Carisbrooke Castle on the Isle of Wight in the English Channel. My plan for the second book in my Legacy Series, Out of the Colonies is still in the laptop stage and reveals my ancestry in our New England Colonies, Cambridge, Salem, Salem Village, during the Salem Witch Trials! My plans for Book Three, Untitled as yet - reveals a secret and famous American Literary Author and Ancestor! To whom I learned of recently during my research on Salem’s Witch Trials, but you will have to wait until this book is released to find out his name.